What’s the meaning of “Sticks and Biscuits”? 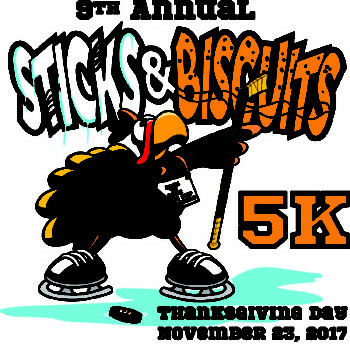 — This Thanksgiving 5K is organized by the Palmyra Ice Hockey Club, which uses “Sticks”, and “Biscuits” is hockey slang for the puck. 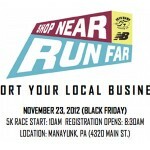 The Sticks and Biscuits is one of the most successful Thanksgiving Day 5K’s in Central PA. In order to give all participants the best possible experience, this year’s race is being limited to 1,700 entries. This year’s race helps fund the Palmyra Ice Hockey Club and also benefits local charities. Fun Run entries rec’d by Nov. 10 get a cotton Sticks and Biscuits Tee. Kids Fun Run at 8:15 (1 mile, kids age 12 and under, on the adjoining turf field). Weather permitting, Kids Run will not be held if the turf field is covered in too much snow. Note: This race comes close to selling out in advance every year, so on-line registration is strongly recommended (online registration is easier and faster if you have birthdates and shirt sizes ready for all family members you are registering for the event).